Crews are preparing the third floor for interior drywall installation. The window openings have been covered with plastic to protect the interior of the building from rain. The office spaces located on the third floor are framed out and Carpenters working for H. Carr & Sons will soon begin hanging drywall. Meanwhile, crews were finishing up initial MEP work (mechanical, electrical, plumbing) including pulling cable throughout the floor. There will be special meetings held for each of the Boston and Eastern Area locals on Monday, August 31 to discuss contract proposals. A vote will be taken to accept or reject. Members should make every effort to attend and notify as many of their fellow Brother and Sister members that meetings are being held. Details on the times and locations of the meetings will be provided as it is confirmed. Details about the time and place of each meeting are being sent to members via letter or automated phone message. If you are an active member and did not recieve the message, please call your Local Union for information. Tonight's debate between Boston Mayor Thomas Menino and candidates Micheal Flaherty and Sam Yoon has been canceled as a result of the death of Senator Ted Kennedy. There is no word on when it might be rescheduled. "It is with great sadness that this morning we learned about the passing of Senator Edward M Kennedy. His passing marks the end of a remarkable career dedicated to representing and serving the citizens of the Commonwealth of Massachusetts and poor and middle class families throughout our country. 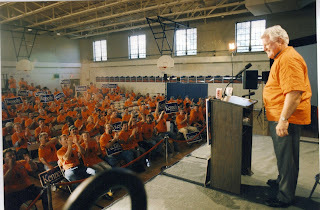 The Carpenters Union had a special affection for Senator Kennedy, one which grew out of his dedication to ? ?bread and butter?? issues that impacted the daily lives of blue collar workers. His legacy will be his work on issues such as health care, civil rights, education, worker safety and minimum wage. Working people looked to Senator Kennedy and found a powerful and influential person fighting for them. He won so many important legislative victories through fierce advocacy, bipartisan coalition-building and a legendary knowledge of the legislative process. Though memorials will feature his legendary speeches and family history, many here in Massachusetts will remember the service he provided. In a time of need, Senator Kennedy? ?s office could be relied on to return a call, explain an issue or cut through bureaucratic red tape. Simply put, he cared. Though born to a mythical political family, he approached his work with a pride and dedication that was easily recognizable to his constituents and we loved him because of that." An interesting twist in prosecuting immigrant-exploiting labor brokers. The US Attorney's office has charged a Kansas City based firm--Giant Labor Solutions--under RICO for their treatment of hundreds of workers in multiple states. "Giant Labor and two other metro-area companies turned the workers into slaves, fanning them out to housekeeping jobs in hotels and other businesses in 14 states while forcing them to live, sometimes eight at a time, in small apartments for which they were charged exorbitant rent, federal authorities allege. Most of the workers were in the country illegally and were threatened with deportation." "...Used false IDs to create the companies and open dozens of bank accounts for them, prosecutors said. The workers, who were mainly from the Dominican Republic, Jamaica and the Philippines, paid thousands of dollars ?? often taking out loans in their home countries ?? for Giant Labor to bring them to the U.S. and get them temporary visas, authorities said. But once they arrived, the workers were stuck in small, sparsely furnished apartments, had no access to their mail and were charged so many fees that they were sometimes told on payday they owed the company money." A New York Times piece from last week takes a look at the difficulty the recession has caused...rich people. The rich are not quite so rich, it seems. They are, however, still much wealthier than the rest of the nation. And while the article focuses on the "hard times" of millionaires like John McAfee, who has been forced to sell not just his Hawaii mansion, but his New Mexico one as well, income inequality is not something that's leaving America anytime soon. Few economists expect the country to return to the relatively flat income distribution of the 1950s and 1960s. Indeed, they say that inequality is likely to remain significantly greater than it was for most of the 20th century...Market forces that have increased inequality, like globalization, are also not going away. With the fire proofing of the steel beams complete, the trailer that held the mixing and spraying apparatus has been removed from the site. This allowed for crews to begin framing out the exterior walls on northwest side of the third floor. This type of framing is called fly-by framing. The framing is moved off of the concrete floor and is attached to the side of the concrete beam using specially designed and engineered clips to attach the metal framing. The dimples and rectangular stamp design give the clip added strength. All of the exterior walls have been framed out using this fly-by technique. Wood blocking was installed in door openings throughout the building. 2x4s are placed in the door jam openings at locations where there will be wood doors. The door frames and casings cannot be nailed into the metal studs, so 2x4s are screwed into the metal studs to create a strong nailing surface for the finished door frame and casings. There will be approximately 110 wood doors throughout the building. Steel fire doors will be located in stair wells, exits to the parking deck and in the lobby area. The communicating stair from the first to the second floor will have a glass door, as well the conference room on the third floor and the front entrance doors. Ayanna Pressley, an At Large candidate for the Boston City Council stopped by NERCC headquarters to drop in on a meeting of the Carpenters Women's Committee meeting last night. Pressley has been endorsed by NERCC and Boston Local affiliates. For more on Pressley's campaign, visit her website. Union contractor "one to watch"
Congrats to Beth Sturtevant of CCB for being named one of the 2009 Women to Watch by Maine Biz, the state's leading business publication. The company prides itself on being a ??self-performing?? general contractor, meaning it employs much of its craft labor directly, rather than through subcontractors. CCB is also a union shop, one of few of its kind in Maine, an alliance that supplies the company with well-trained and certified employees, she says. Sturtevant, in her role as a board member for the Associated General Contractors of Maine, has long advocated and lobbied in Augusta for ? ?responsible contracting?? practices, or limiting use of independent contractors in the regular work force, a tactic some companies use to avoid providing health insurance, access to workers?? compensation and other benefits. She? ?s also dedicated to her employees?? safety, and says the company? ?s experience modification rate, an insurance calculation that reflects historical safety statistics, has remained below average for years. ? ?Ultimately, the buck stops with me, and the culture and the attitude we have in this company is safety is the priority,?? she says. Are you seriously interested in woodworking? So is Kari Hultman, a Pennsylvania-based graphic designer who pursues her passion and blogs about it along the way. Check out Kari's blog, the Village Carpenter, for a look at her work and some things she's learned along the way. Government agencies' efforts to enforce laws against misclassification of workers as so-called independent contractors has once again received prominent coverage in the business press. The Hartford Business Journal released a "Special Report" that is being featured on the front page of their website. The piece includes comments from enforcement agents, exploited worker and Bob Fitch, owner of union contractor New Haven Partitions. The story is well researched, including a sidebar story comparing the efforts in Connecticut to those in other states, including New York and Massachusetts. With the exception of a few pieces the Dens Glass work is completed on the entire building. Waterproofing membrane ?C seen below in blue ?C is virtually complete on the Eastside of the building as well as the South end area of the cantilever. This self- adhering, rubberized material is completely water proof. In certain locations, such as around the windows, there is added adhesion, a contact cement, that is rolled on to the window sill and below, so that the membrane doesn? ?t blister. A grid system of aluminium strips will be installed on the wall to hang the panels and to ensure that the reveal joints are aligned. Fastening clips, which are screwed through the Dens Glass will also be installed as part of the grid system. The Alucabond panels are being fabricated at the Sunrise Erectors shop in Canton, MA by members of Carpenters Local 51. The panels arrive to the shop 5x10 sheets, which are cut to specifications and fastening clips are installed. When the panels arrive at the Carpenters Center they will be installed using a process known as ? ?blind fastening.?? The panel clips are matched up with the clips that were installed into the aluminum grid system for fastening. This process requires that each panel be matched up to a specific location throughout the building. Carpenters installing the panels will read numbers on back of the panel so they know where each goes. An undocumented immigrant has filed a lien for wages he's owed for work he performed for a drywall subcontractor...on an immigration center. The worker--calling himself "Jose" in the Target12 story (embedded below)--did work on a Federal Immigration Center in Johnston, Rhode Island. He says he was hired by Ocean State Drywall and owner Joseph Pagliaro. In the video a visibly nervous Pagliaro confirms that the man worked on his job and that he knows him, but denies that he employed him or ever paid him cash for wages. He claims that another subcontractor hired "Jose" but does not mention the subcontractor's name or identity. Calson Corporation is the general contractor on the project, which is owned by a company named Atwood Development, LLC in Johnston. It is being leased to the federal government for ten years. "Jose" claims he is owed more than $2,300 dollars. He says neither he nor another undocumented coworker was ever asked for proof of residency. "Jose" reached out to NERCC Organizer Matt Murphy for help because he's been cheated out of wages in the past and had had enough. Murphy and other organizers in the area have been working with "Jose" to try to get the money is rightfully owed for work he did. The defective Chinese drywall debacle has been making news for months now, with homeowners plagued by sulfur fumes that smell like ? ?rotten eggs?? and cause air conditioning coils to corrode. Residents complain of sinus and respiratory ailments, eye and skin irritation, persistent runny or bloody noses, headaches, and asthma. Some situations were so severe that residents had to vacate their homes. In some cases, victims have been harassed by builders into signing unfair, one-side remediation agreements. It seems that the gypsum in drywall, which typically comes from mines, has recently come from a chemical process involving lime or limestone and gas from coal-fired power plants. Contaminants and sulfur found in power plant smokestacks are supposed to be removed in the process. Failure of proper removal is the cause of foul odors, respiratory complaints, and corrosion, according to some Chinese experts in building supplies. Others say phosphogypsum (calcium sulfate), a radioactive phosphorus substance, is to blame. Banned for use in U.S. construction in 1989, the EPA says prolonged exposure to this radium-contained element can lead to a higher risk of lung cancer. As of July 31st, construction of the Carpenters Center is 48.5% complete!